Kristen Wiig is calm, cool and totally secure. So how'd she get so funny? Kristen Wiig's Saturday Night Live characters respond to social discomfort by talking too much and moving too much. They're a blur of tics and noises. (It's not coincidental that she does a great Kathie Lee Gifford impression.) But in the dimly lit Gordon Ramsay restaurant of her L.A. hotel, in her hipster black knit beret, Wiig is leaning back, sipping green tea and not talking or moving much at all, just being cool. It's awkward but not comic awkward. Normal awkward. Usually performers will answer "How are you?" with enough to fill your notebook. But Wiig didn't do any performing at all until she was in her late 20s. Not college theater, not high school talent shows, not little skits for her parents. In fact, she doesn't really like to speak to crowds. "At parties, I'll start talking and notice everyone is looking at me and feel dumb and say, 'Forget it,' and then start eating things," she says. Which is how she is in movies  no crazy hair, no crazy eyes, no crazy jumping into other actors' shots. In movies, she's the antiWill Ferrell. She played indie small in Ghost Town, Adventureland and Extract. After she was in minor roles in two Judd Apatowproduced movies, Knocked Up and Walk Hard: The Dewey Cox Story, Apatow asked her  as he has Steve Carell, Seth Rogen and Jason Segel  to write a movie that she could star in for his company. So she and Annie Mumolo, a friend from the L.A. improv troupe the Groundlings, co-wrote Bridesmaids, a dude comedy with a chick-flick plot: a single, unemployed woman (Wiig) is asked to be the maid of honor for a friend (Maya Rudolph) who's marrying a rich guy. It's a smart blend: the Apatow heart squishiness is already built in, and the crude jokes feel new when told from a woman's perspective. We've all seen explosive diarrhea onscreen before  but we haven't seen it from characters trying on wedding dresses. And until now, no film has given nearly enough attention to the plight of mothers changing the sheets of their pubescent sons. Still, a movie with both fart noises and gowns is a tough sell, and it took four years for Bridesmaids to get made. "Maybe studios don't want to see women acting in a way that isn't womanly," Wiig, 37, says. "Maybe people don't." But the more Wiig devolves into horribleness in Bridesmaids  tearing apart the wedding-shower cake out of jealousy  the more sympathetic she is. "Kristen has this really likable personality that doesn't require her going big," Apatow says. "There are certain people  you love them, but you like seeing them abused. It might be the most important comedy quality: 'I love you, but I want to see horrible things happen to you,'" he adds. "She plays wilted very well," says Mumolo. "It's these boiling emotions inside barely making their way out because she's working so hard to cover them." Covering her emotions doesn't seem as if it requires a lot of work at the restaurant, as we eat our finger sandwiches. 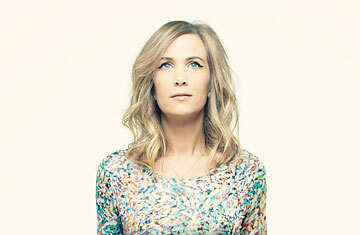 The problem is that Wiig is shy, cool and pretty  not the petri dish of insecurities from which most comedians are made. She loved high school. (Not only was she not in any clubs; she was also one of those people who sneaked into yearbook pictures of the clubs to make fun of them.) At the University of Arizona, Wiig studied art. Then she moved to L.A. and did arty jobs: florist, graphic artist for a plastic surgeon (she illustrated what patients would look like after an operation), decorative painter. When Wiig eases up around people  I've heard  her weird creativity comes out, and she does a lot of voices and imitations. So many that the decorative painter she worked for recommended that she see a show by the Groundlings, the troupe that trained Phil Hartman, Conan O'Brien and Lisa Kudrow.